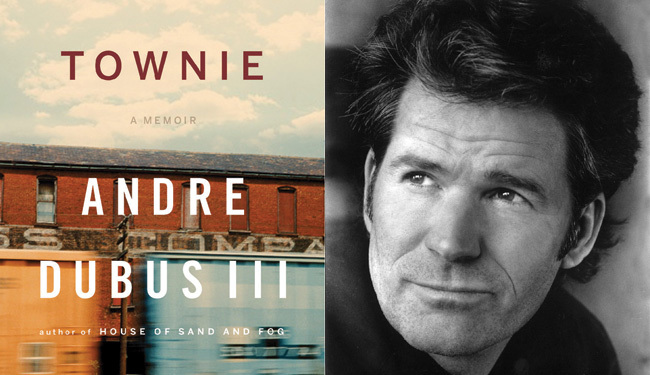 Best-selling author Andre Dubus III met with students, faculty, and the public during two lectures at Thornton Academy last Thursday. Dubus met with approximately 150 students and teachers during the afternoon and then, at 7 p.m., an audience of approximately 175. He read from his latest work “Townie” and answered questions about his craft. Dubus spoke at the Saco school as part of the Lloyd Hunt lecture series and the focus of his talk was the art and nature of creative non-fiction. Many students in the audience had read his novel “House of Sand and Fog” as part of their English curriculum and from the questions they asked, the students were interested in both the writing process and his inspiration for the book. In a sometimes rambling 90-minute talk, peppered with quotes from authors that ranged from Samuel Beckett and Ernest Hemingway to Bill Moyers, Dubus emphasized the role of imagination in his work. During the afternoon lecture he was asked by one of the students if he used an outline during the writing process. “No. To me, I’d rather walk on the tightrope above the flames with no net,” he said. In one of the more descriptive exchanges between the author and the audience, he talked about the process of visualization. Dubus told students that the answers to all of a writer’s questions, and more, are part of his creative process. “I’m not smart enough to do that in an outline,” he said with a smile. He told students to follow the advice of filmmaker Mike Nichols. He explained that with words and imagery, a writer should answer a basic question for the reader. Dubus experienced abuse, violence, alcoholism and crime during most of his youth. All of that has come out in his latest book. “The hard part was telling my family about my book,” he said. Dubus is the son of the writer Andre Dubus and his parents separated and divorced when he was a young boy. His father was a struggling writer and teacher and after the divorce, what little money the family had, was divided in half. During much of his childhood, he and his brothers and sisters moved from home to home and apartment to apartment as their single-mother tried to find work and raise the family. They ultimately settled in tough blue-collar neighborhoods of Haverhill, Mass. and from there, Dubus graduated from high school in 1976. Dubus started writing seriously in his early 20s but it wasn’t until his sixth novel, some 20 years later, that he achieved public acclaim. Today, Dubus writes full time and is an assistant professor at the University of Massachusetts, Lowell where he teaches creative writing. “He had an impact on my kids,” said Amy Glidden, an English teacher at Thornton. In fact, during most of his lecture, both the audience and the speaker seemed to be directly connected to one another. “I didn’t see any texting or tweeting or twixting,” Dubus said with a smile when he talked about the students. He seemed especially pleased when one young boy asked him about his least favorite part of writing. After a short pause and a smile, he explained that it was when he recognized portions of his plot just won’t work. “Sometimes your imagination takes you down this road and you realize it can’t happen because of something you wrote 200 pages ago,” he said. After the final question of the afternoon, Dubus took time to sign books for some of the students and find out about their work and interests.